﻿﻿﻿“Art imitates Life.” So said Aristotle. Oscar Wilde, on the other hand, argued the opposite, stating that Life imitates Art far more often than does the reverse. It’s a classic “chicken-versus-egg” question, impossible to prove or disprove. However, in the last year, I’ve had a chance to test each theory personally. 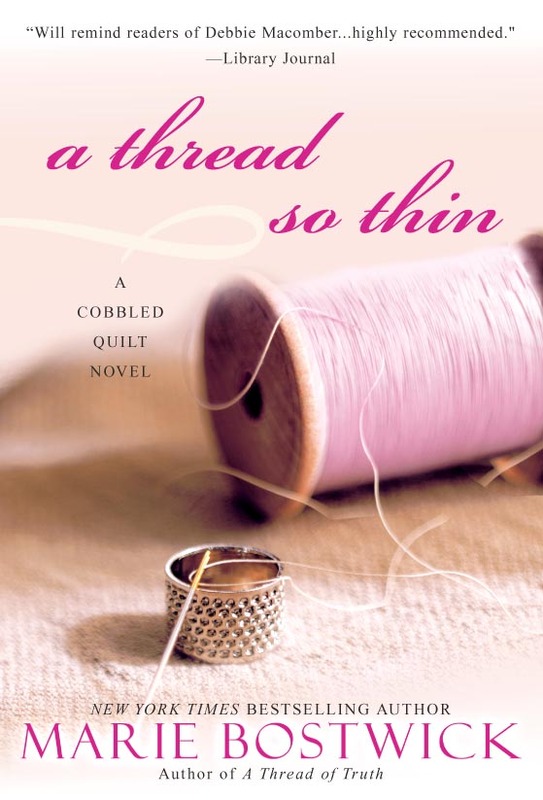 If you’ve read my Cobbled Court novels, A SINGLE THREAD, A THREAD OF TRUTH, and A THREAD SO THIN, set in the Cobbled Court Quilt Shop, in the fictional village of New Bern, Connecticut, you already know that one of the over-arching themes of this series is the importance and power of friendships among women. A SINGLE THREAD was my fourth novel. As I was writing it, I sensed that this book had the potential to touch readers in way that my other novels hadn’t. With its multi-generational cast of characters, and gentle message of faith and friendship, this story, I felt, was one nearly every woman could relate to. After the book was released, my jam-packed mailbox confirmed that hunch. Women from all over the country wrote to tell me how the story made them laugh and cry, how the experiences of the characters mirrored their own, and how they wished for friends like those they’d met in the Cobbled Court Quilt Shop, friends who would accept them as they were, warts and all, and stick with them through joys and hardships, thick and thin, no matter what. I knew just what they meant. You see, the Cobbled Court Quilt Shop isn’t just a product of my imagination; it’s also a literary patchwork of the places and people I’ve known in my twenty-plus years as a quilter. Art imitating Life. Quilting is a piece of my life that I cherish, one I very much wished to share with others, especially the women who had reached out to me through letters and email. One of them, Maureen, a frequent correspondent and member of the online quilt circle I’d opened on my website, urged me to organize a “swap”, in which a group of quilters make and trade enough blocks for an entire quilt, with one block from each member of the group. Maureen said she’d be willing to coordinate the first “Cobbled Court Quilt Circle - Online!” swap, suggesting a Christmas theme. Looming deadlines prevented me from participating in that first swap as a quilter. However, I decided to surprise the others with a copy of “Snow Angels”, the 2009 Christmas anthology in which my story, “The Presents of Angels” appeared. I sent seventeen signed copies of the book to Maureen, asking her to quietly tuck one into each quilter’s packet of completed blocks. ﻿﻿But I wasn’t the only one trying to play “Secret Santa”. 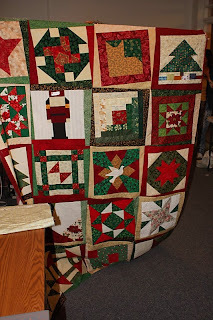 A few days before Christmas, a package containing seventeen beautiful Christmas quilt blocks arrived on my doorstep. Each of the seventeen swappers had made eighteen blocks – one for each participant plus one more, for me! 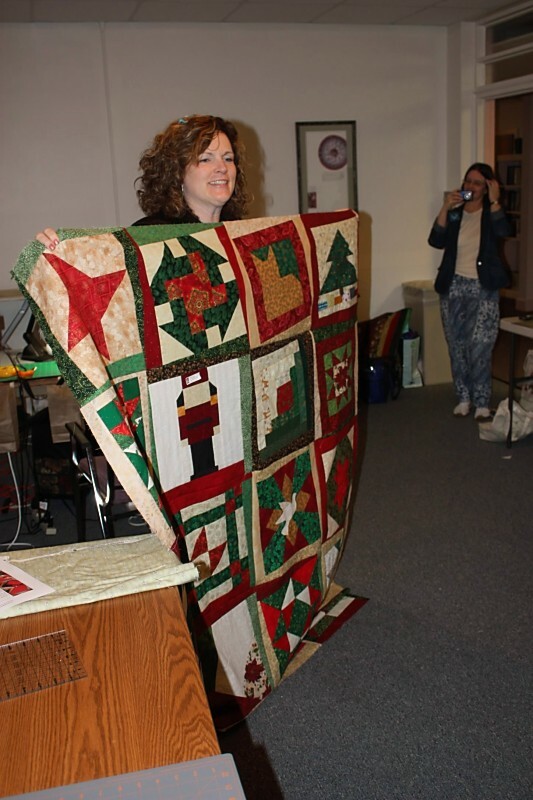 It was a tremendous surprise and a great example of the camaraderie that exists among quilters, even those who meet online. 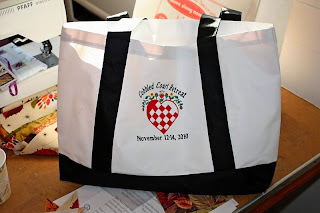 The women of my online quilt circle discuss quilts, share ideas and experiences, exchange stories and dreams, good news and worries, prayers and praises, supporting and encouraging each other as true friends always have and always will, just like the characters in the Cobbled Court novels. Life imitating Art. Not long ago, some of these virtual friends decided to meet face to face. 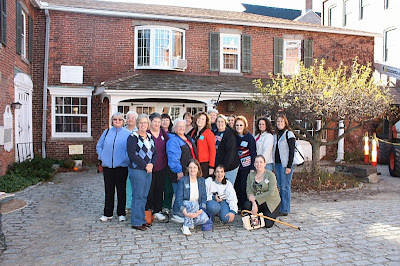 In November of 2010, seventeen women from as far away as Texas, Michigan, and Canada, came together for a weekend of quilting and bonding in Litchfield, Connecticut, the village upon which New Bern is based. the quilt she made from the quilt blocks. ﻿﻿﻿﻿ But one question remains unanswered about that wonderful weekend in November. Was it an instance of Life imitating Art? Or Art imitating Life? I can’t tell you. But I know it was an experience I’ll never forget with friends I’ll cherish forever. 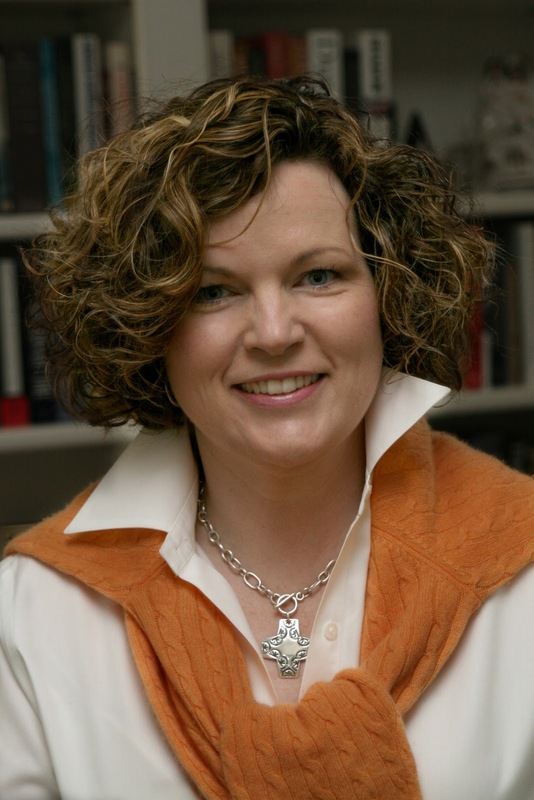 Marie Bostwick is a New York Times best-selling historical and contemporary fiction author. ﻿﻿﻿﻿﻿﻿﻿﻿On the path to becoming a novelist, Marie Bostwick worked in the bean fields of Oregon, sang and danced in musical productions, acted in TV commercials, taught religion to deaf children, ran an event-planning business, worked as the scheduler for a U.S. Senator and directed women’s ministries for a large church. Today Marie lives in Connecticut with Brad, her husband of twenty-eight years, and their one son still in high school. When not writing or volunteering for her church, she enjoys quilting, watching movies and sipping tea on the front porch with her friends and spending time with her family. Marie can be found at http://mariebostwick.com/ where she offers a wealth of informtion and fun to readers, writers and quilters. What a wonderful story, Marie! Thank you for sharing with us and visiting the Inkwell. The quilt is beautiful and a representation of that special weekend. How amazing that so many of you ladies were able to get together. I am so blessed to have quilts my great-grandmother made. But I've never done any quilting myself. I'm a scrapbooker. Although I think I like most crafts! Thanks for stopping by, Marie. thank you so much for sharing your thoughts and pictures!!!! Wonderful post! I love crafts. It's finishing projects that can be tough, but I'm working on it... Love the can-do attitude and comraderie amongst the quilters! The books sound great! There is so much more I could tell you about the women I have met through this cirle. They truly support one another - they pray for each other, send cards, notes, make surprise quilts for special occasions (they made a baby quilt for my new grandson). When one woman was unable to go to the retreat because of a schedule conflict, she donated her spot to another woman who wanted to go but couldn't because she'd lost her job. I am simply and truly in awe of their kindness and care for one another. Though they live all over the country, they really live out loving their "neighbors" as themselves. Great thoughts! I don't enjoying sewing of any form, but I do greatly value my female relationships and books that touch people's lives. Ok Deb, just like my heroine Emma, my curiosity has been aroused... what kind of quilt have you started and allowed to leave forgotten? I started a crib quilt for my 2nd child while pregnant but she came 6 wks early and never did get back to it. It's an appliqued night scene where I used a leaf print for a bush, a brown dotted one for a walkway, etc. I agree with you, Ernie. Between the photographer, the choice of clothes and Marie, it's a fabulous shot. Lisa, you may not be a quilter, but her eye for color and detail has been passed down to you. The proof is in the beautiful 'scrapbooking' sets we use here at the Inkwell. This blog would not look as professional as it does without your artistic flare. And those buttons you made for us to wear to ACFW conference were a hit! Thank you for all the time you spend making the rest of us look good. DebH, as a graphic artist you use your artistic skills in other ways, too. I'm sure if you really wanted to you could create an eye-catching quilt of beauty, but between your job and family, you barely have time for writing never mind quilt-making. However, if you ever want to go on a retreat... say half quilting/half writing, let me know and I'm there! Hey Cheryl, it sounds like a quilting circle is like a writing group where the frequent interaction and 'show and tell' spurs others to 'up' their game plan. Dina, I love sewing! I actually have about a dozen 2cube boxes of fabric stashed away. Most of that fabric was chosen specifically for quilting because of the prints. But while I sit at my laptop and click out the stories, my sewing machine and serger gather lint. You wouldn't think it'd sneak into the cases but here on the farm it does. Major cleaning bill to get them back into top form. Ugh. Marie, how do you balance writing and quilting? Both are time-consuming and need precision. Do you have a set number of hours you spend on each a day? I gave away most of my fabric a few years ago. I had boxes of it! People like me should not work in fabric stores, but that seems to be the rule! I only kept what I could not bare to part with because I just don't have room to store it anymore. I'm definitely a fabrics and yarn and textile girl. Thanks for starting such a good conversation Marie. I didn't even know Anita Mae was a quilter. You can tell this was before facebook, eh? How many teen girls start quilts these days? Probably more than you'd think, Deb. My daughters have both been very social and yet at home, they always stayed busy with hobbies. Whenever Crystal was at home, her hands were always busy make beads from Fimo or paper and then beading them on a loom. Today she's an accomplished jewelry designer. I remember once when Crystal and I were in a fabric store. We were discussing prints for one project or another for our local fair entries. I guess one woman overheard Crystal point out a fabric to me because the woman whispered, "It's so nice to see a teenager and mother interested in the same thing." I hadn't thought of it before. It was just a part of our lives. Now I have the 2 boys left at home. You've all met JJ who is my sidekick for rock hounding and coin collecting. It's just something we love to do together. But Nick... well, Nick is into electronics. So time with Nick means heading into Best Buy and picking out a Wii or Kinect game we can both play. I'd love to teach him my woodworking skills because my scroll saw and drum sander sit unused down in the shop, but Nick's efforts lack precision. I'd rather play games with him than worry about him losing a finger. Sorry... I seem to have rattled on again. Ugh. Well, writing is my business and quilting is my pleasure and you know what they say about that...business comes before. I don't write quickly (wish I did) so I have to write long. I write all day, every day and try very hard to keep up with page count goals I set at the beginning of each month. However, as most writers will tell you, there is much more to the writing biz and writing. Probably a third of my day is spent managing the non-writing aspects of my career. These days, writers really are entrepreneurs. So, like most working women, quilting is the reward I give myself after a long day or for a few precious hours on the weekend. I do take myself off to quilt retreats a couple of times a year for several days of concentrated stitching. Wish I had time for more of that. What a wonderful post, Marie. Thanks so much! The quilt is gorgeous; what a treasure. I don't know how to quilt, but it's on my to-do list. I've saved some of my kids' favorite clothes and pajamas from when they were little so I can put them into memory quilts -- the spiderman shirt my son wanted to wear every day when he was 2, the princess pajamas my daughter insisted on wearing even when they were too small, items like that. One of these days, I've got to sit down and learn how to put them together. This post was a wonderful reminder to nurture our friendships, which are true blessings from God. Thanks Marie and Anita Mae! I guess because I'm still trying to break into the business, I feel I have to devote my days to the business of writing. And then my reward is surfing friend's blogs, facebook, eharlequin and all the other social network sites I enjoy during the evening. But there are several ACFW authors who've banded together over knitting. It's quite nice to see them together in the lounge, knitting away. They were certainly in their element the year Debbie Macomber was keynote speaker. Aww, thanks. Anita Mae. That means a lot. I really enjoy playing with the blog and changing its clothes. My grown-up version of playing with dolls, I guess! Anita Mae! You were at that workshop? Wasn't that fun? Debbie is an incredible writer and even more incredible person. She has been such an inspiration to me in so many ways -- spiritually, professional, and artistically, and....craftily? Is that a word? Anyway, Debbie brought me along on a "yarn crawl" with her a couple of years ago and, though I'd never knitted a stitch, I walked out of the shop with enough yarn for three projects! And, of course, I picked these patterns that were way, way too hard for a beginner. I remember Debbie looking at a pattern I'd chosen once and saying, "You don't do anything easy, do you?" So true! But I think every writer is like that. Could there be a tougher way to try to make a living than writing? And I don't just mean the odds against making it, I mean the actual writing. It's hard, wrenching, often draining. A couple of days ago, I hit a wall with my work in progress. Couldn't think where to go next. And so I called my wonderful agent, whining and waving a flag of surrender. Today, I spent two hours brainstorming and plotting with her over the phone. I'd come up with an idea, and she'd poke her fingers through the holes, again and again, arguing, questioning, and pushing me until I finally found the thread of the story - a believable one. Exhausting. I actually had to lie down after. But I don't mind. She pushes because she cares. And I let her because I care too. Oh...my...how I do run on. One other thought, so many of you have spoken about quilts you haven't finished but want to and those who would like to quilt but haven't tried. Well, to you I say, "Go for it!" Quilting is so satisfying and really, so much easier than you might believe. If you can sew a more or less straight seam, you can make a quilt. And you'll meet the most wonderful people doing it. I like knitting too - it's easier to take knitting on tour than quilting - but, for me, quilting is more of a "full contact" craft. I like the community aspect of it as much as anything. Thank you Anita Mae for the prayer. 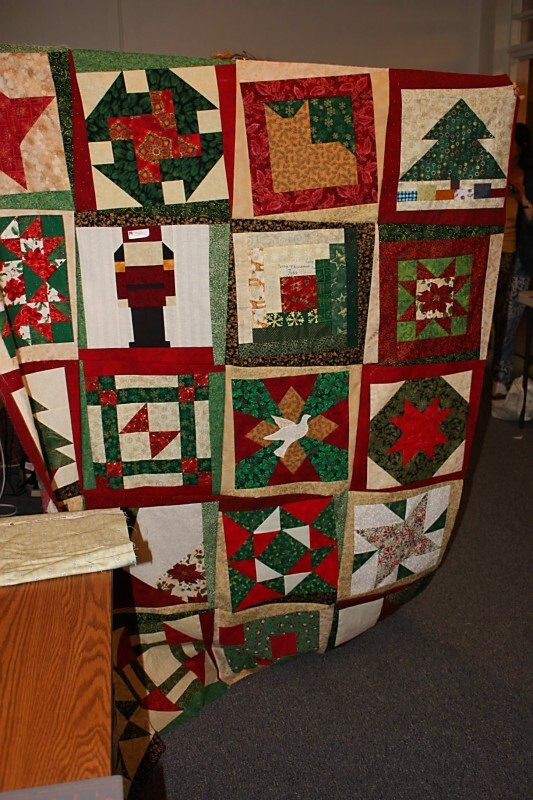 I love how tender hearted you are and I would love to be in a quilter's circle with you! Debra- true confessions... I also have an unfinished baby quilt... I started it for the twins. They will be eighteen in February!! This was a post that especially spoke to my heart. Very cool and fun post, Marie. What a special group of friends. I was recently part of making a huge quilt, though all I did was design a square. I didn't do any of the sewing, and it's a good thing, too. The quilt is now hanging on a wall at my hospital. I used to knit and crochet a lot but my favourite handcraft of all is counted cross stitch. Unfortunately, I can't do any of those or the arthritis creeps in and I cramp up. I believe the only thing that keeps it away is the exercise my fingers get at the keyboard. The ladies at our church make a quilt for our youth the year they graduate from high school - both boys and girls. Some years we have 2 leaving and some none. Those years we make a couple and send to the local Bible School for those students. It's also why I like the Wii and Kinect because I don't have to grip the 'paddle' or I'm done for the day. Suzie - I like that you designed a square for the hospital quilt. Maybe you can take a photo and show us some day. Once, I made a single 12" block for the local fair. I think it was called the Mexican Star or something. I really like picking the colors and piecing it but I'm such a perfectionist I kept sewing and taking it apart repeatedly as I tried to get the points to line up perfectly in the centre. My hard work paid off and I took home the red ribbon. (Up here in Canada, we get a Red for 1st place and a blue for 2nd place.) It took me hours to piece that block however and I never did complete any of the other squares. You've blessed us with your stories of warm companionship and brought things out of us we didn't know about each other. Thank you for sharing this. Developing godly connections between women seems to be another overarching theme in my life this year! A group of ladies in our community are starting a group called Titus Women, where we can come together to encourage each other and to teach each other skills like quilting and knitting and crafting. I can't wait!